Reliable Car Title Loan Services By Instant Cash Canada! Are you a resident of Hamilton? Do you have unexpected expenses to pay before your next paycheck? Do you need a bit more money than the typical cash advance? Contact Instant Cash Canada and apply for Car Title Loans Hamilton. To qualify we have the very minimal requirements for the loan: a clear car title (used as loan collateral), a valid Canadian driver’s license and proof of permanent residency. The loan amount can be up to $40,000 and is based on the value and condition of your vehicle; not on your credit. The best part is that you get to keep driving your vehicle while you pay off the loan! We also have longer loan terms up to 4 years. There are no prepayment penalties or hidden application charges for the loan. We have e low-interest rates and convenient monthly payments as low as $97/ month. No mandatory credit checks and job verifications for loan approval! We provide quick financial help by using your clear car title as collateral. Check Out The Eligibility Criteria For Auto Title Loans Hamilton! 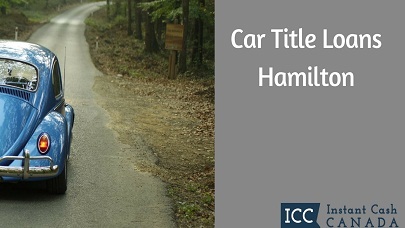 Get Approved For A Vehicle Title Loans Hamilton Today! Call Instant Cash Canada (Toll-Free) 1-866-840-7395 For Further Details!